It was bound to break eventually. In fact, I’m surprised it hasn’t already – having survived decades of two sons, many visiting children and dogs, a dozen resident cats. Yes, my grandmother’s Chinese vase she converted into a lamp lies in pieces too numerous to reassemble. My cats took off in the middle of the night, launching themselves off our bed, down the long hallway, into the living room, across the back of the couch – and crash! – onto the side table and into the lamp. I got up in a hurry. What were they chasing? Nothing I could see. I’ve heard this crash before and usually it’s the wood-based lamp on the other side of the couch. Also a Chinese antique, but strong enough to survive assaults. No, this time it was the turquoise and coral vase/lamp. I burst into tears, which set the cats running back down the hall in the opposite direction. Since then, I haven’t had the heart to pick up the pieces behind the table in a corner on the floor. The vase was given to my grandmother by her father, a Scottish sea captain who brought it from China in the late 1800s or early 1900s. After retiring in Scotland, he came to live with her and my grandfather in Montreal and her home included many of his Chinese treasures – statues, plaques, screens. 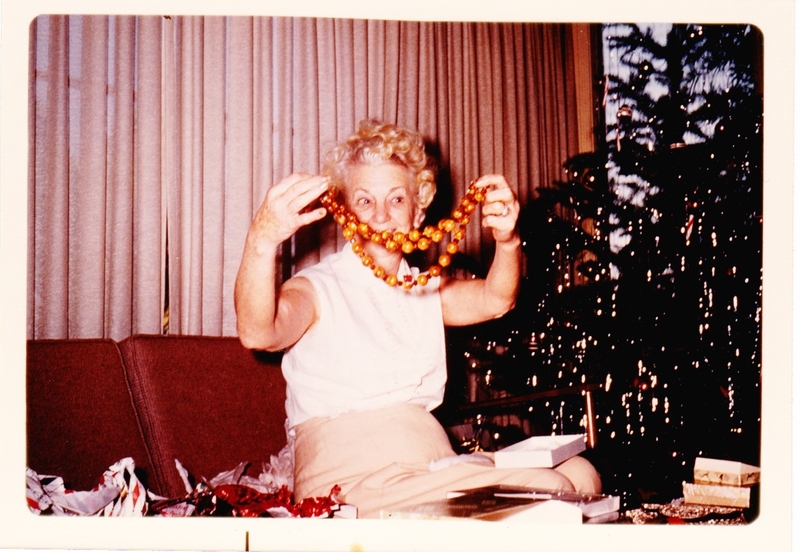 My grandmother was a creative woman who loved to cook, sew and garden. She wrote letters to me that were little gems of poetry. If she were alive today, she’d be a writer or an artist. She was also modern in her tastes, despite the Chinese antiques. 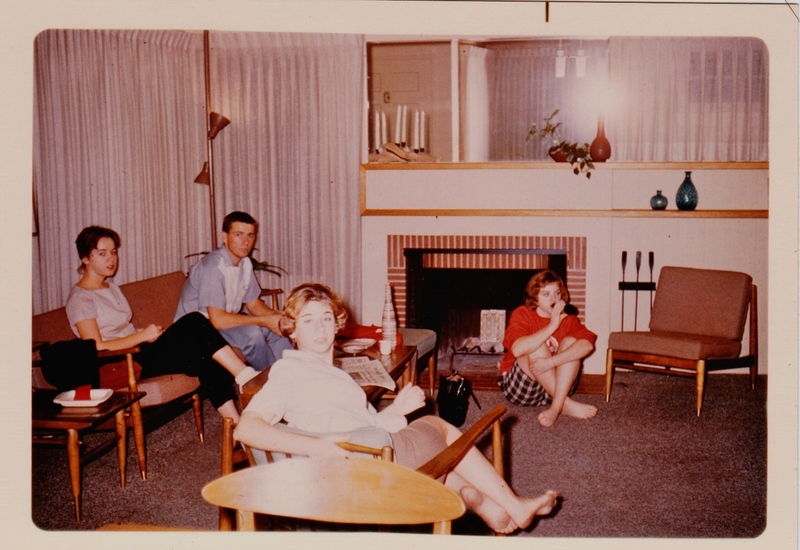 In the 1950s, she redecorated her living room with lime green couches and blond, kidney-shaped tables. She made the housepainter repaint the walls because they weren’t the right shade of pale lime green. When she and my grandfather followed us out to California in the ’60s, she furnished their tiny apartment overlooking the ocean with Scandinavian teak – clean, simple, elegant lines perfectly suited for their new, smaller home and lifestyle. A nearby store featured ultra modern home accessories and she became one of their favorite customers, buying items from Finnish Marimekko cushions to space-age Danish silver bowls to Swedish crystal glasses. When she died, a year after my grandfather, my sister and I inherited several of her pieces. I loved the lamps because they fit in with my furniture as my own tastes and budget changed. I also adopted and immediately loved their two matching Danish modern teak bureaus. My grandparents initially mounted them on their bedroom wall. Talk about streamlined! Then my grandfather added slim legs. I used them for years in my bedroom and in recent years in my dining room as a side buffet. They too seem to fit in with any décor. My favorite was in front of a wall I painted orange. Now this look that was once new and is now old is new again. It’s all the rage, mid-century modern. We want to go back in time to a simpler age. As I scale down in my own life, I want to live with less, distill to the essence. I mourn the passing of 100 years, now in fragments. I think I’ll move the teak bureaus back into my bedroom, get rid of the rattan monstrosity, and welcome in the modern spirit of my grandmother.